Are you really going to let this economy knock you out? Hammer You into the Ground? The Wealthy Warrior is mentally STRONG and so their businesses or careers are financially STRONG. Now YOU can adopt their "millionaire mindset"—one that gives you an uncanny INNER POWER to put up a FIGHT and WIN this economic battle... because you deserve to KEEP and PROSPER IN the business or position you've worked so hard to get! "Since... one year ago, my net worth has skyrocketed! Last year my net worth was about $90,000; now it is close to half a million. I can't thank you enough!" "After years of having 'money control us,' we now understand what it is like to 'control money'. It's AWESOME! We are having a BLAST! Paying the bills this month was the first time in 32 years that we weren't at each other's throats! Thank you, Thank you, Thank you!" "I'm a waiter and have never earned more than $25,000 a year. Three weeks after the course, I made $14,000 in eight days! Thank you!" "I am a real estate agent. After the course, I closed an amazing four deals in one weekend!" I'm not denying times are tough. But tough times call for tough people. And the millionaire mind thinks and acts very differently. If you're willing to stand up to this economy you'll join the ranks of today's financial freedom fighters—and attain outrageous prosperity in these times! How can I be so bold? Because plenty of people are striking it rich right now, while others—who were already rich—are maintaining their wealth. It's not rocket science. It does, however, require you to take a close look at the ultimate secret weapon—a "money thermostat"—that's within you (and every person on this planet) right now. If you don't know what your thermostat is set at, and you're already second-guessing yourself in these turbulent times, I can predict your financial life: Your business is on shaky ground. Your job is on the line. Mediocre Results are NO LONGER an Option. This Breakthrough is for ULTIMATE WEALTH ACHIEVERS! "Today, I have 18 sources of passive income and I no longer need a J.O.B. Yes, I am rich, but, more importantly, my life is enriched, joyful, and abundant! But it wasn't always this way. Paralyzed with fear, shame, and hopelessness, I withdrew from everyone and everything around me. I continued to punish myself right up until I was dragged to the Millionaire Mind. During that transformational weekend, I reclaimed my power and resolved to take control of my own financial destiny... And now, I'm actually having fun managing my own money!" ...We heard so much information that had us saying, 'No wonder,' 'Oh, so that's why,' 'Everything makes sense now.' We were very excited... It is almost a year later and we still do not argue about money—we just talk about what we learned. We are no longer in debt; in fact, we have money in savings—the first time in our 16-year relationship. Yeah!... We feel free." The seminar these people are speaking of is one you'll attend, too. But in the comfort of your home! I can't wait to tell you what we've done for you. Because whether a lack of money is a major issue right now—or you're successful but you've run into this turbulent situation with the economy—the solution is simple: reset your money thermostat! I'll explain how this breakthrough works in just a moment. First, allow me to introduce you to T. Harv Eker—the General leading this freedom-fighting adventure. Harv discovered this breakthrough the hard way. He left school early and went out into the world in search of his wealth. He thought he had it all—the right mentality, habits, desire, skills, knowledge. But the real world kept knocking him out cold. "Since attending your program several months ago, my income has quadrupled. Thanks!" "Our family did Millionaire Mind Intensive eight years ago. Sometimes a person wonders if the changes will last. Yes, they do! We now live in our dream house, drive our dream car, and are working on creating multiple streams of income. Eight years ago, we didn't even know enough to ask the right questions. Harv took us through it step by step. Our net worth was below zero—now, it's over 1/4 of a million dollars!" "After Millionaire Mind Intensive, I had so many major breakthroughs for my business, I can't even list them all! Thank You!" "Eighteen months ago, my wife and I were a week away from divorcing. We were over $150,000 in debt and we always fought about money. Your program changed all that and today we are happily married. We are now debt free and we own two companies worth over a 1/4 million dollars." "I have a graphic design business that was on the verge of closing. Within 60 days of the course, I had so many clients I had to hire two new assistants to help me!" Saved More Money in 10 Months than the Previous 10 Years! "The changes that have happened to me since listening to Harv speak are nothing short of profound. I have saved more money in the last 10 months than I had in the previous 10 years and on top of that my income has taken a quantum jump! Thank you, Harv!" Financially Free at Age 20! "At the age of 18, I attended my first Millionaire Mind Intensive; now, 19 months later, I'm 20, financially free, and make over 5 figures a MONTH in PASSIVE INCOME! Your courses, camps and teachings have helped me manifest my dream life! Now I get to help others do the same! Thank you!" Experience your own money miracle! Order Secrets of the Millionaire Mind in Turbulent Times risk-free TODAY! He saw 14 businesses fall flat on their faces. A grown man in need of living with his parents for shelter, he was desperate for a solution that worked. A wealthy friend of his father's pulled him aside and gave him some advice. Harv followed his advice and, lo and behold, on his 15th business, he hit the jackpot! Using a $2,000 credit card loan, he opened one of the first retail fitness stores in North America. He grew the business to ten stores in only two and a half years. Then he sold part of the company to a Fortune 500 corporation, becoming an instant millionaire! But it didn't last long because his money thermostat wasn't set on high... yet. Have you ever felt like you hit the jackpot—perhaps landing a big account, a major client, or securing a hot-selling product—but, for some reason, it doesn't happen consistently? Or something happens to make a deal or sale fall through? Well, Harv found that out, too. In less than two years, his wealth was GONE. Through a combination of poor investments and unchecked spending, he was back at his original net worth... again. What had happened? The problem was his inner money thermostat was not set for a high level of success—and he lost his money. All of it. It was only when he had reset his money thermostat to the level of success he wanted that he quickly regained his wealth. This time, he was able to keep it, grow it, and become a multimillionaire! What does this mean for you? It means that, if you've already discovered and used universal principles to success and riches, but you're wondering why they haven't worked consistently—or even at all—for you, your inner money thermostat needs to be reset, too. Once you reset your money thermostat, those principles will start working on overtime for you. And that's when you start to feel the real power of the Wealthy Warrior. You stop wondering things like, "Should I sell off my business? Back off? Or hand out resumes as backup?" Instead, you step up to the plate and stop making excuses. And you start conquering all the mindsets, habits and thought patterns that are holding you back. Because, the truth is, when you're strong, your success will be strong. When you're strong, your wealth will be strong. — Right at Home Base! Harv resets people's money thermostats at his extraordinary three-day seminar called "The Millionaire Mind Intensive." Through a series of fun, interactive exercises, this seminar resets your money thermostat on the spot so that financial success is automatic and natural for you! It's changed the lives of hundreds of thousands of people from all around the world. We've persisted with Harv for years to get his life-transforming secrets into the hands of our customers. This year, we finally did it! We've secured this exclusive seminar for you in our NEW program, Secrets of the Millionaire Mind in Turbulent Times! And the timing couldn't be more perfect. Harv's a no-nonsense, get results kind of guy. And you're in for a real breakthrough when you get your hands on Secrets of the Millionaire Mind in Turbulent Times. Seventy percent of this program is LIVE seminar recordings—bringing you the most recent strategies and life-transforming thoughts, habits and actions for dealing with today's economy. The rest of this program includes EXCLUSIVE studio recordings—where we asked Harv how to solve our customers' biggest challenges today—because we want you to SOAR through this economy. Not get wiped out by it. "I can't explain how grateful we are that we were introduced to you by one of my wife's friends. At the time I'd just received a $10,000 cut in pay. We were desperately looking for options, as we were not making ends meet anymore. At The Millionaire Mind Intensive, we learned the tools that helped us create financial freedom. Once we put the tools in place, miracles started to happen. We were able to purchase five homes within the next year. All with a minimum profit of at least $18,000 each. The fifth house had a profit of $300,000, six times my previous yearly salary! I was able to quit my job of 14 years and become a full-time real estate investor, giving me the free time to be with my family and friends..."
"If someone had said to me I would have doubled my income and simultaneously doubled my time off, I would have said that was not possible. But that is exactly what has happened. In one year our business grew 175 percent, and in that same year we took a total of seven weeks of vacation time... This is astounding considering we had experienced minimal growth over the previous five years and struggled to get even two weeks of time off a year..."
"...I am 18 years old. I have just completed my first year of university. I attended The Millionaire Mind Intensive two years ago and I have been using the techniques I learned there ever since... Using the money that I had saved through your methods, I was able to spend ten days on the southern coast of Spain. What an experience! I wouldn't have had the financial freedom to go wherever I wanted and do whatever I wanted if I hadn't implemented the strategies I learned..."
YES, I want to turn this economy into my greatest opportunity to strike it rich! What's Your Inner Money Thermostat Setting? How much do you earn each year? Your inner money thermostat setting is similar to the setting on a thermostat. You can't go too much further above or below it for long. So if you're set right now for a level of success of, let's say, $80,000 a year, you're going to remain stuck there—until you change the setting. It boils down to this. If the temperature in the room is 72 degrees, chances are really good the thermostat is set for 72 degrees. If it's very cold outside and the windows are open, the temperature in the room can drop to 65 degrees. But the thermostat will kick in and drive that temperature right back to 72 degrees. On the other hand, let's say it's really hot outside and the windows are open. The temperature may rise to 77 degrees, but it won't stay there. The thermostat will kick in and drive that temperature right back down to 72 degrees. The only way to permanently change the temperature in that room is to change the thermostat setting. And the only way to permanently change your financial life is to change your money thermostat. We've all heard the stories of the lottery winners. Those who win five, ten, fifty, a hundred million dollars, yet wind up back to where they started five or so years later. Why? It's because their money thermostat is set for low. If you doubt this, look at the results (or lack of results) you're getting now. Also think about how your finances have been over the past five or so years. If you've been stuck at the same income level for years now, there's a reason for that... one that can easily be resolved with what you're discovering in this email! Why is that? Your money thermostat is within your subconscious mind. Which means it needs to be reset on a cellular basis. That's why we recorded Harv's LIVE Millionaire Mind Intensive seminar for you. It's a skyrocketing high-energy event that's highly experiential. You can follow along in your home. Respond with the audience. And reprogram and recondition your mind in such a fun, exciting manner right there on the spot. Then watch what happens in your life. You may not even know why they turned around. Why? Because subconsciously you'll have been reconditioned right there to radically think differently about money, yourself, success, your business, and everything else inside. Your normal decision-making process will have changed. What you didn't know before, you'll know now. What you wouldn't have done before, you'll do now. Obstacles will look like opportunities. You will have fully embraced the Wealthy Warrior's attitude! You don't even know why you make the decisions you do, but you know the result. It's like your mind is one big old file cabinet—and it's storing un-supportive wealth files such as "money is bad," "money won't buy happiness," and "money is scarce." The reality is that, for most people, 99 percent of their programming doesn't support success—or happiness. Does yours? Look at your result. That will tell you. So at this seminar—enjoyed at home—you'll delete files that are not working for you. Then, you'll insert files that rich and happy people have... so you reset your thermostat to that of a MILLIONAIRE'S MIND. When you do, you'll brave this economic battle like a true Wealthy Warrior and come out victorious! These are proven brainwave-changing exercises for installing the exact amount of money you desire... taming fears... managing money wisely... and all kinds of other supportive wealth files. Getting What You Want... Finally! "Street Smarts with Universal Principles." These are strategies that work in the REAL world and the universal laws that work no matter what. And once your thermostat is set to a higher level, it's like you're one gigantic magnet—finally pulling AMAZING things together for you. Remember, Harv struggled for 14 years and, in 2½ years, became a multimillionaire once he learned these principles. It was only when he had reset his thermostat—and used these principles—that he gained his wealth, grew it, and STAYED wealthy! What Harv did to shed the fat weighing his company down in this economy—to recreate a much leaner, efficient, profitable machine! It's something you may consider doing yourself. How to use the power of the warrior's commitment to get the universe working on overtime to bring you what you want. How to use the "arrow exercise" to liberate yourself from the biggest mind obstacle or belief that's holding you back. Learn about the kind of person that's succeeding right now and how to adopt a more positive, wealthy warrior attitude—"I can take on the world"—because staying stuck in today's "woe is me and the world is falling apart" attitude won't get you too far. The simplest, easiest way to handle and manage money that even a five-year-old could do. The BEST way to keep your job in today's economy. Do this, and you'll make yourself indispensable (your boss would be crazy to let you go once you do this). The secret to getting paid what you're worth: How to earn the money you really want—by understanding how the law of income works. What the Millionaire Mind knows about customers today—and why it will help you gain more customers than you can handle—at a time when the demand isn't as strong. How to get really good at the "business" side of a passion. This is the only way to realistically get rich doing what you love. A refreshing way to look at marketing and the tools, techniques and tactics to help you make breakthroughs in this arena: It's about creating a strategy you'll feel good about. Harv gives you examples so you know how to "pull" customers to you without any sales pressure at all. This will come as a great relief to you if you dread marketing. Effective leadership these days: If your company's not as successful as you'd hoped, get the principles that'll turn that around for you. Bottom line is: You've got to become the King or Queen of your Kingdom! How to raise your energy sky-high so you can perform at peak levels—and why it's so important. Think of an Olympic gold medalist: do you think they could win if they had, "Yeah, I'm doing pretty good" energy? No way! They need to FEEL FABULOUS and BELIEVE they can conquer challenges. Who Harv believes is the REAL cause of economic downturns (and no, it's not the politicians or bankers!). STAY CLEAR of this and you'll find YOUR economy is ALWAYS FANTASTIC! Yes, YOUR Economy Could Always Be BOOMING! Just use the Laws and Rules in this program—the ones that will support your new money thermostat setting—and it won't matter what the rest of the world's economy is up to. Think about it. Was everyone rich before the economy plummeted? No! The majority of people blaming the economy for their problems now probably weren't doing so well before, or maybe there were just doing okay. But probably not FANTASTICALLY good. The economy is just their excuse. It's never about what's going on "out there". It's what's going on inside you. Once you reset your money thermostat and get the actions that support it, you'll WIN and PROSPER in this economic battlefield! Is your business missing one of these vital organs? As crucial as hearts are to humans, there are three life-saving elements you need to run a profitably healthy company these days. No more. No less. Harv lets you in on what they are and how to use them effectively. Learn to leverage these business principles in a job—so you can take the lid off your income there. It's the only way you'll ever go from $100,000 a year to $500,000 or more. And if you're thinking there's no way on Earth your boss would ever go for that, just wait 'til you hear the proposition Harv gives you. It's an irresistible offer no boss can refuse! "I'm not being paid what I'm worth." "This product used to be a top seller, but now it's not and I want to know how to fix that." "How do I put together a winning ad that'll really grab people's attention these days?" "What do customers really want right now—and how can I give it to them?" "I'm not sure what to do with my business, stocks, or real estate right now—do I sell them off?" "How do I use these principles if I work at a job? Can I really get wealthy in a job?" ...and other concerns weighing on you right now. Use the Rules and Laws of Life you'll discover in Harv's program and you'll start making the right connections, relationships, and resources that lead to happiness and success... because this time, you'll have the right money thermostat setting that allows these things to enter and STAY in your life. When the economy changes—and it will—you're going to be one of the winners. You're going to be on top. You're going to have taken market share. You'll see. You'll know how to do it in tough times—so when the easy times come again, you'll find it's a "piece of cake". Think about this: The Great Depression was the GREATEST time in history for people to get rich. RICH! Not just, "Yeah, I'm doing well." But REALLY rich! The Rockefellers, Kennedys, Carnegies, and others all made massive wealth during that time. Why? Because the Depression allowed them to purchase things while they were cheap. And today you have that same opportunity. Like what? I'll tell you in a moment. First, I want to address any doubts you may have about my confidence in the return of the economy. When you listen to this program, Harv will reveal the universal principle that PROVES the economy is on its way up—to sun-shiny days—again. Once you know what this principle is, you'll never let the economy knock you out ever again. It's a breath of fresh air, really. I can tell you this right now, though: This is your LAST CHANCE to get in on the sales that are going on right now. Pretty soon, everything's going to go up in price again. Yes, things are getting expensive again. And the crazy part? When prices are sky-high, that's when the majority of people start to buy again. That's when they realize the economy has turned around. But right now, you have the opportunity to BUY things on SALE! What's on sale? In the investment world, you can buy great stocks that have lost 80% of their value. Yes, you can buy them for 20-30 cents on the dollar right now. In real estate, you can buy properties for a fraction of what they cost just a few years ago. Will it come back? Yes! In the business world, you can hire great people for less, lease great space for less, get deep discounts on TV ads for less, and on and on. How do you pick a stock? How do you buy good real estate? How do you do anything well? Harv will give you the three keys—RV, RY, and RK—in this program. But again, the most crucial thing here—it all starts with your money thermostat. Get that reset and everything falls into place. Before Harv reset his money thermostat, he turned opportunities to STONE, not gold. But that's all changed now—and soon, for you, too. Look At What Industry Leaders Are Saying About Harv Eker! "Harv Eker is one of the most extraordinary speakers and trainers in the world today! Harv's experiential techniques are transformational and he creates amazing results every time he speaks!" "T. Harv Eker is an electrifying speaker! He has the ability to transfix an audience, motivate and enlighten them, and give them information in a way that they absorb it fully. I've seen and heard a lot of speakers; none are as dynamic as T. Harv Eker!" "T. Harv Eker is a master at making the road to riches simple..."
"I have witnessed and admired Harv Eker's work for years..."
"The RETURN of the Economy"! The reality is that, when you're making more money, you'll spend more. Wisely, of course! When you spend $20 at a local mom-and-pop store, you're giving that shopkeeper a certain amount of lifestyle. The shopkeeper can now spend a little bit of that themselves. Then, the next shopkeeper can spend a little bit, too. But what happens when you're super-wealthy and you spend $1,000 in a store? Well, that shopkeeper has a lot more money! Which means he or she can spend a lot more, too. Then, the next person spends more, too. All thanks to the domino effect you started. The economy goes around like that. The more you have, the more everybody else has! See how this works? It's a fabulous money-freeing cycle! You're part of the solution! And that's EMPOWERING! EXCLUSIVE to Nightingale-Conant! The Four Factors for PROSPERING RIGHT NOW in This Economy! The very first session in this program gets right to the economic challenges you're faced with now—and the four factors that GUARANTEE you'll prosper! Because, remember, NOW is the time to STRIKE IT RICH! …All the answers you need reside in these four factors! Right now, the Millionaire Mind knows something about customers. Once you know what it is—and cater your products or services to this urgent need—you'll HIT THE JACKPOT. Timing is EVERYTHING, and because this advice was recorded recently, you're going to cash in on this opportunity BIG-TIME. Even If You Return This Program! Harv's goal is to program the new Millionaire Mind thermostat setting into your mind. Once you install these new wealth files—files that support your new temperature setting—into your mind, they're there. Permanently. Forever. As you can see, we're the ones taking the risk here! But I'm confident once you get your hands on Secrets of the Millionaire Mind in Turbulent Times, you won't want to let this secret weapon go! Session 3: You Are Worthy of a Millionaire Mind! Seventy percent of this audio program is RECORDED LIVE—and remember, the LIVE portion of this program is HOW you'll reset your money thermostat at a cellular level, making the changes permanent! We've brought you two of Harv's most popular events—The Millionaire Mind Intensive seminar and The Wealthy Warrior. The Millionaire Mind Intensive alone costs attendees $1,295 each and that's cheap compared to some of the events Harv holds! But you get all this with our incredibly low, no-risk offer! PLUS: You'll get a Comprehensive Workbook to map out your new financial life and stay on track! Your Current Level of Success. FINISH with a New "Millionaire's Mind" Thermostat. One Set for True, Lasting Financial Freedom! Listen: If you don't achieve financial freedom, Harv has failed. And he detests failure. So you can rest assured he's packed this live seminar and studio recordings with all the wealth files, tips and strategies he could to make you ENORMOUSLY successful with a soon-to-be Millionaire Mind thermostat setting. So I urge you to grab your risk-free copy of Secrets of the Millionaire Mind in Turbulent Times RIGHT NOW! With your new thermostat setting in place, you'll see the RIGHT opportunities, seize them, and unlock the profitability in your current business or job. Remember, now's the time to strike it rich! Join the freedom fighters who are NOT letting the economy take them out. Grab your copy—right now, at this very moment—and secure your financial future! P.S. : This program will alter your life forever. You're going to transform yourself into one lean, "I'll do whatever it takes," freedom-fighting machine! Which means you're going to have a whole different income coming in... the kind you REALLY want! I know this is true because it changed Harv's life. He's used it for nearly 30 years to maintain his amazing level of success. And we're thrilled to have it available for you now! Get your copy right away! I want to raise the heat on my inner money thermostat to a Millionaire Mind's setting so I can turn this economy into my greatest opportunity to strike it rich! From Zero to Millionaire in Only 2½ Years! 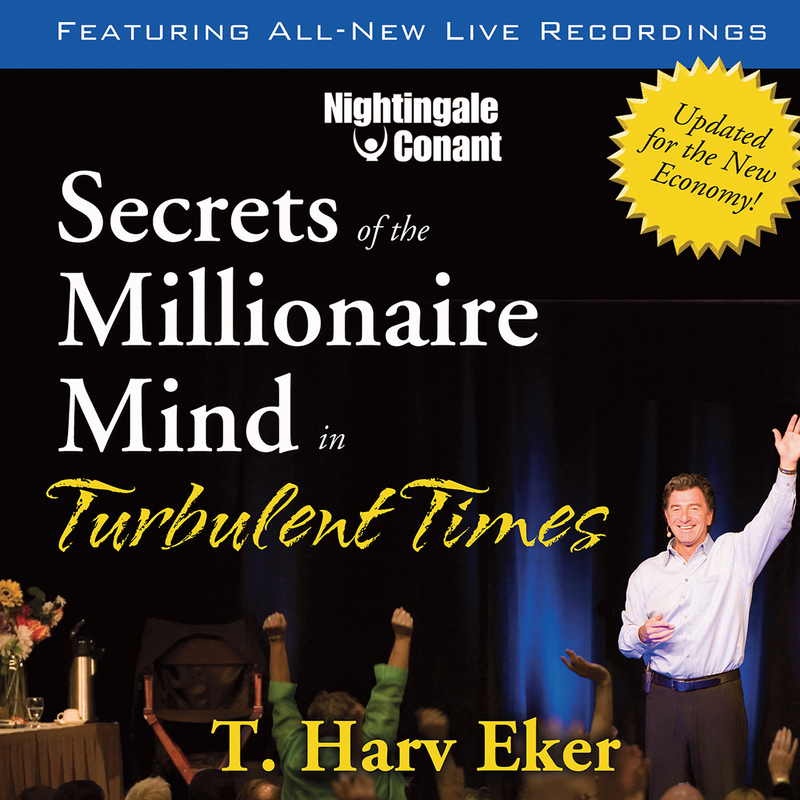 Using the principles he teaches, T. Harv Eker went from zero to millionaire in only 2½ years! He combines a unique brand of ‘street smarts with heart.’ T. Harv Eker is the founder and president of Peak Potentials Training, the fastest growing personal development company in North America. He has already touched the lives of over 500,000 people from across the world, helping them move closer to their goal of true financial freedom. Eker’s high-energy, 'cut-to-the-chase' style keeps his audience spellbound. T. Harv Eker's motto is "talk is cheap" and his unique ability is getting people to take "action" in the real world to produce real success. Eker is the author of the best-selling books Secrets of the Millionaire Mind and SpeedWealth. He has also developed several highly acclaimed courses such as The Millionaire Mind Intensive, Life Directions, Wizard Training and Train the Trainer. He is also the producer and trainer of the world-famous Enlightened Warrior Training.